The future of Downtown Los Angeles is in play again. The Grand Avenue Project is the biggest public re-development spectacle to come to town in a long while. Under the banner “Re-Imagining Grand Avenue, Creating a Center for Los Angeles”, the newly invigorated push to revitalize LA’s center is once again focused on Bunker Hill, the area around the recently completed Walt Disney Concert Hall. The Grand Avenue Project is being promoted and organized by the Grand Avenue Committee, a public/private partnership that has aims to “…transform the civic and cultural districts of downtown Los Angeles into a vibrant new regional center which will showcase entertainment venues, restaurants, retail mixed with office buildings, a hotel, and over 1000 new housing units.” Directed by the Los Angeles Grand Avenue Authority, a joint power entity formed by the union of the Community Redevelopment Agency of the City of Los Angeles (CRA/LA) and the County of Los Angeles, the Grand Avenue Committee has the singular agenda of creating no less than a new 3.2 million square foot regional center. Also planned for redevelopment is the existing County Mall, a little used public space that stretches from the Music Center at the top of Bunker Hill to City Hall at the bottom of the hill. Ingenuously, the enhanced park is being promoted as “LA’s own Central Park.” The fact that the County Mall it is neither central to Downtown Los Angeles – or greater Los Angeles or for that matter – nor at 16 acres anywhere close to Olmstead and Vaux’s 843 acre urban oasis seems beside the point. What matters most is that the entire project is hinged on the premise that Downtown LA’s dead-after-5 pm curse can be finally vanquished. Eli Broad, billionaire tract house developer, patron of the arts and architecture, and vice chairman of the Grand Avenue Committee said recently, “We’re hopeful we’ll be able to create a street where people will stay after work and one that will be a draw for the entire region.” Bringing foot traffic to Downtown LA after dark should cost $1.2 billion. Of this approximately $300 million will be required for public infrastructure, and approximately $900 million will be needed for real estate development. If successful, the project will generate 16,000 long-term jobs and raise $85 million annually in local, county and state taxes. The Related Companies, backers of the $1.7 billion Time Warner Center at Columbus Circle in Manhattan, with architects Skidmore, Owings & Merrill under partner David Childs, and Elkus Manfredi. Operating as Bunker Hill Ltd., only one other team is primarily LA-based – Weintraub Financial Services with the Bronson Companies, Apollo Real Estate Advisors, and the Vornado Realty Trust. The local consortium counts Gehry Partners, LLP as their architect with landscape architects the Olin Partnership and the promising LA firm Daly Genik Architects. Curiously, Gehry, who would seem to be Bunker Hill Ltd’s trump card, has down played his role, publicly announcing that he is not so much interested in the design of the project as its potential for urbanism. “For me, it’s not important if I do a building – I’ve got Disney Hall. I’m more interested in the urban planning,” Gehry recently stated. Nevertheless rumors of all-star designer involvement have spread with Jean Nouvel and Zaha Hadid pegged to join the Gehry led team. Earlier yet, Sir Norman Foster was temporarily aligned with Donald Trump’s team, which has since fallen out of the bidding process. Notably absent from the redevelopment frenzy is the local dream team of Ming Fung, Craig Hodgetts, Thom Mayne, and Eric Owen Moss who have joined together in discussions with a number of potential developers, but for the moment remain [strangely] on the sidelines. Should that team ultimately join the Grand Avenue fray it could also include Wolf Prix / Coop Himmelblau, designer of the new Central Los Angeles High School # 9 and Steven Holl, architect for the new Los Angeles County Natural History Museum. Also conspicuously out of the running in this redevelopment frenzy is Dutch urbanist and iconoclast Rem Koolhaas, whose last two ventures in Los Angeles, a scheme for the Los Angeles County Museum of Art’s new facilities on Wilshire and headquarters for Universal Studios over the hill in the San Fernando Valley both fizzled after losing funding. 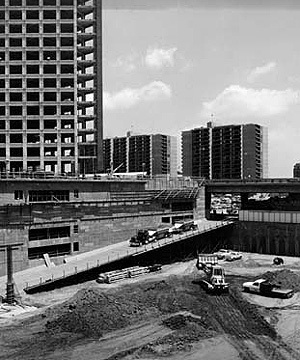 Despite, or perhaps because of the optimism surrounding the project, there seems to be a state of amnesia about the number of “ground-breaking” and largely unsuccessful fresh starts Bunker Hill has been given over the last five decades. The view that many Los Angelenos hold of downtown as one of the city’s final redevelopment frontiers seems endemic, and its power wards off any bad flashbacks associated with the numerous failed efforts to redevelop Bunker Hill. Granted, LA is coming off a blissful decade of major civic achievements – Richard Meier’s Getty Center, Rafael Moneo’s Cathedral, and of course Walt Disney Concert Hall. Additionally, Angelenos have witnessed an overhaul of the city’s infrastructure, including a $2 billion Alameda Corridor transport conduit, a new subway system, a linked light rail network, and an “intelligent” metro bus line. So perhaps accordingly, the city’s dismal record downtown has yet to spark any questions about the viability or the reasoning behind the latest attempt to revive Bunker Hill. Indeed, the redesign, promotion and marketing of Bunker Hill’s future are something of a local tradition in line with LA’s infamous skill for manufacturing the future while destroying its history. 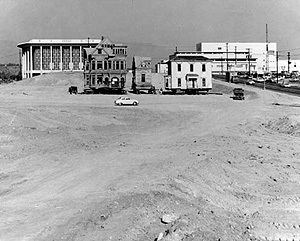 As early as 1950/51 the newly established CRA tagged the then down at its heels Bunker Hill as “Redevelopment Area Number One.” Overlooking the downtown of the 1930s and ’40s – the LA that Raymond Chandler called “that old whore” – Bunker Hill was a community of reportedly 10,000 low income, largely immigrant and minority residents living 10 to a room in squalid, disintegrating structures. The initial Master Plan developed by the City Planning Authority called for the complete clearing of the area. In its place the study proposed a series of 20 story high public apartment blocks arranged around octagonal shaped courtyards. 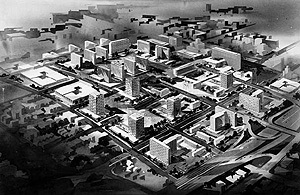 The scheme, widely pilloried, was scrapped and by 1959 the firm of Charles Luckman and Associates was retained to develop a new master plan. 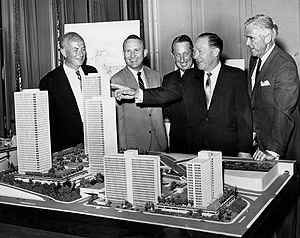 Luckman, former CEO of the Lever Company and later partner with William Pereira, planner of Irvine, one of this nation’s largest master planned communities, put forward a new scheme that envisioned for some 11 million square feet of office and retail space, 2,000 hotel rooms and 3,000 residential units. 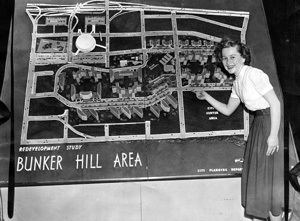 Not coincidentally, Luckman’s plan also proposed that Bunker Hill be scraped clean, graded, and neatly divided into a series of gridded zones connected by overhead walkways and moving sidewalks. It would be 15 years before the Luckman plan for Bunker Hill could begin to be fully implemented. In the intervening years, amendments were made for cultural facilities and significant height variations. 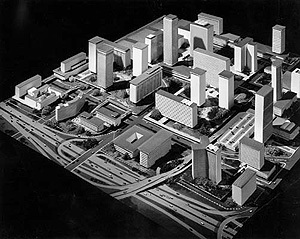 The master plan was refined again in 1968 by Bay area firm WBE – Wurster, Bernardi & Emmons – by which time the Bunker Hill High Rise Apartments, the first new structures on the Hill, were completed. By 1970 Bunker Hill was shaved clean. Save the 40 story Union Bank tower there was very little new construction completed or in the ground. Aerial photographs from the period 1973-74 look less like Los Angeles than images of Rotterdam after it was bombarded in 1940. Aside from those few lone towers, Bunker Hill was effectively the largest construction site in North America. From 1975 until the mid-Eighties close to twenty housing, retail and office structures were erected in and around Bunker Hill. These included five major buildings – the Bonaventure Hotel, the Security Pacific National Bank (now the Arco Towers), the Arco parking structure, the Los Angeles World Trade Center and the Figueroa Courtyard. 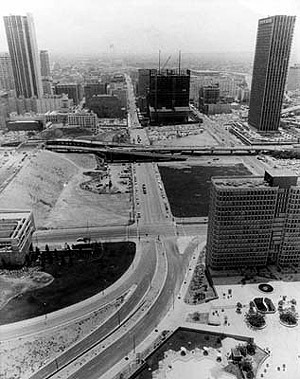 The construction boom that emerged in the early Eighties drove the development of the Angelus towers, the Citicorp Center towers, the Marriott Downtown, and the Wells Fargo Center. This active new city core would lead the CRA to conduct a nationwide competition for a mixed-use 11-acre development to be situated at the top of Bunker Hill. Bunker Hill Associates with Arthur Erickson, Kamnitzer, Cotton, Vreeland and Gruen; and Maguire Partners with Harry Perloff, Barton Myers, Edgardo Contini, Charles Moore, Lawrence Halprin, Cesar Pelli, Hardy Holzman Pfeiffer, Ricardo Legoretta, Frank Gehry, Sussman Prejza, Carlos Diniz and Robert Kennard. 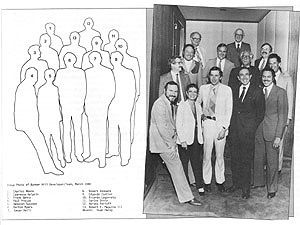 By June of 1980 the competition had come down to pair of final competitors – Arthur Erickson’s team and the super group led by Harvery S. Perloff, Dean of the School of Architecture at UCLA, that would come to be known as the All Stars. 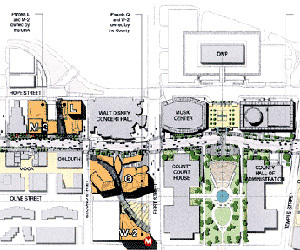 Canadian Erickson’s winning scheme, the so-called California Center, presented a composition of several towers connected by a plinth arranged around a swirling center at the site’s “city-end”, the California Plaza. Essentially its ‘parti’ developed from an established, homogeneous Modernist gesture unified by an unremittingly banal language – tower blocks and excavated courtyards. The All Stars’ scheme, by contrast, abandoned the singular Modernist gesture in favor of a sort of Post Modern orchestrated chaos. In the place of a unified nod to the master plan developed by Luckman, the All Stars presented an ‘exquisite corpse’ – 9 projects approximately connected by a variety of public spaces developed by Moore and Halprin. Emblematic of Moore and Gehry’s adventurous and often outré public work of the period (Moore’s Piazza D’Italia or Gehry’s Loyola Law School) the entry was rejected. 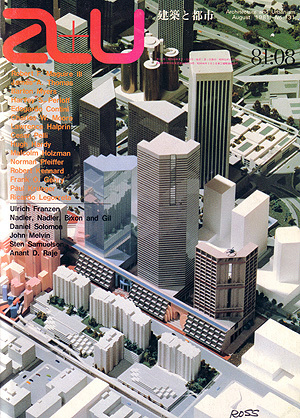 Given the increasingly celebrated re-emergence of Downtown as a bona fide residential and cultural center, and the entrenchment of LA more generally as a center for contemporary architectural experimentation, it seems vitally important now to re-examine the future imagined for Bunker Hill yesterday as a way to sharpen our ideas about Downtown today. One wonders if the current excitement building around the Grand Avenue Project will spark an interest in a genuinely new discussion about Downtown’s prospects or we will be treated yet again to the usual, quotidian developers’ exigencies that are too often passed off as urbanism. “We want a great mixed-use project that works economically,” says David Malmuth, real estate consultant with Robert Charles Lesser Co. and a board member of the Grand Avenue Committee. Malmuth, who helped conceive the recently completed Hollywood & Highland mall, brought Michael Eisner to Times Square while at Disney Development in the early 1990s. 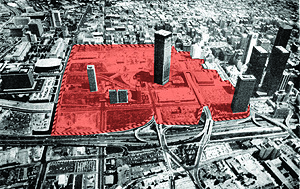 He claims that the need now at Bunker Hill is “… to move more towards a process that’s about urban planning ideas and a financial approach, as opposed to a pro forma that’s not going to be accurate – and that everyone knows is not going to be accurate.” What remains to be seen is what the current definition of “urban planning ideas” means. If the notion of bringing a miniature version of 42nd Street or a Central Park to LA seems to define the outermost limit of what the Grand Avenue Committee is willing to picture as urbanism, then one is forced to wonder how far we have come since the CRA announced its first set of plans for Bunker Hill some 50 years ago. The journey Bunker Hill has made from tabula rasa to Walt Disney Concert Hall hardly seems like a coherent trajectory. However, somewhere in its history Bunker Hill presents a case for the return to something akin to urbanism or at least the will to experiment with our accepted ideas about Los Angeles. “It’s difficult within the public environment not to ask for something that is so specific” Malmuth remarks. “But then you’re locked into disappointment, and you’ll build gradually toward failure. I want to get a great project built here.” While Malmuth may be correct in terms of any assessment that could be made about Bunker Hill’s lost opportunities and erased history, Walt Disney Concert Hall creates a powerful argument for innovative urban form and it must be said here that its success has been entirely dependent on its specificity and the clarity of its vision for LA’s future. In the twenty four years that have passed since the last major competition held to determine the future of Bunker Hill it seems as if Los Angeles has devolved from being the subject of wonder – think of Banham’s paean to this city – to a being a center increasingly concerned with simulating the picturesque urbanisms of the East Coast or 19th century Europe. The intricacy and complexity of the development process not withstanding, one hopes that what remains of LA’s distinctiveness as a contemporary city- its history of architectural experimentation, idiosyncratic forms and cultural diversity- will provide the Grand Avenue Committee with enough impetus to back a motivated team with a courageous scheme for Grand Avenue. This city deserves a proposal for Grand Avenue that is unapologetic about exceeding our present demands of urbanism or the litany of disappointing plans that have been foisted on Downtown Los Angeles. Peter Zellner is an architect, author and curator. He is a Faculty Member at SCI-Arc and Visiting Critic at Miami’s FIU School of Architecture. Along with Jeffrey Inaba, he is the co-founder of ValDes, a non-profit organization dedicated to researching suburban conditions.